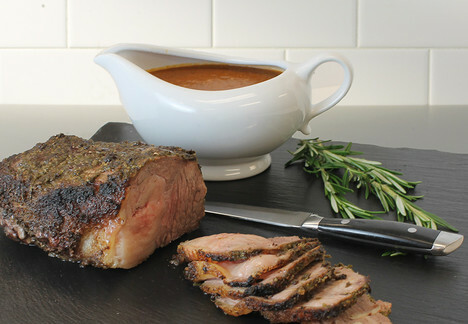 A fresh herb and garlic crusted beef roast with a tomato pan sauce, perfect for any autumn occasion. Cut tiny slits into roast at varying depths and place cloves from 1 head of garlic in each cut. In a food processor, combine remaining garlic cloves, onion powder, pepper, rosemary, thyme and parsley. Slowly stream in oil until emulsified. Rub onto all sides of the roast. Place onion and mushrooms on baking sheet. Top with roast, fat side up. Bake for 5 minutes per pound, approximately 15-20 minutes, then turn off oven. Leave roast in oven for one hour. Do not open the door. Remove roast from oven and let rest for 15 minutes. Pour drippings, onion and mushrooms into a saucepot with tomatoes and beef stock. Heat to simmering. Cook for 5 minutes. Place sauce in blender, and puree to desired consistency. Return to pot and cook over medium heat until reduced to desired consistency. Season to taste with salt. Thinly slice roast against the grain and serve with pan sauce. Tip: To easily remove leaves from fresh herbs, place through the holes of a colander and pull through.